Your 2-hour walking tour begins when you meet your guide on the famed Fremont Street in downtown Las Vegas. Located in the heart of downtown’s Casino Corridor, Fremont Street can be spotted in famous Las Vegas photos and film scenes. On this 1.5-mile (2.5-km) tour, you’re also bound to learn things you didn’t even imagine existed off the Strip, let alone Las Vegas. Discover the joys of randomness found in this part of town: a piece of the Berlin Wall in a men’s bathroom, a 19th-century chandelier from the San Francisco Opera House and 1870s street lamps from Brussels. Check out where Old Blue Eyes and the rest of the Rat Pack used to hang out and walk under the Fremont Street Experience’s canopy of lights in a pedestrian mall while walking past historic casinos like the Golden Gate, Fremont and El Cortez. You might even spot Pawn Stars’ toy appraiser, Johnny Jimenez, tinkering around at the Toy Shack. 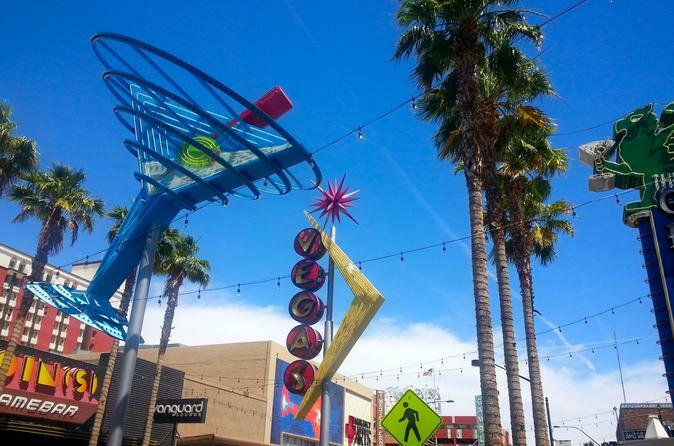 For an example in the art of urban revitalization, visit the Fremont East Entertainment District, home to dozens of new restaurants, galleries, entertainment venues and attractions. Explore the Container Park, a shopping and entertainment center built from shipping containers and see the old City Hall, which has been turned into the Zappos headquarters. By the end of the tour you’ll have a fantastic overview of this fascinating corner of Las Vegas. Love the show Pawn Stars? Upgrade your 2-hour walking tour to add a 30-minute walk past historic chapels and city buildings to the Gold & Silver Pawn store made famous by History Channel's popular television show Pawn Stars. If you’re lucky, you might just see Rick, Big Hoss and Chumlee making a deal! Please note: The tour stops outside of business and establishments to allow for discussion and viewing photos (if applicable) but has no planned excursions inside any establishments (with exception of Downtown Container Park). Pawn Star upgrade ends at the Gold & Silver Pawn where you will be free to browse and shop but does not guarantee entry due to filming, long lines, etc.